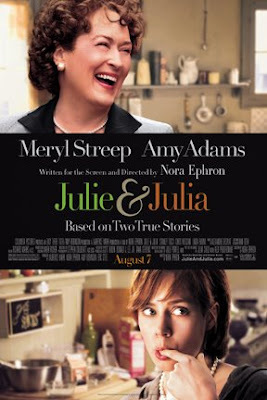 Julie & Julia is the story of two real-life people half a century apart in their journey into cooking. Julia Child, as most anyone knows, is a chef and television personality and the author of Mastering the Art of French Cooking (1961). Julie Powell, on the other hand, is an average American woman who succeeded in cooking all of Julia Child's 524 recipes in one year and documented the experience in her own book, Julie & Julia (2005). The movie is a delightful back-and-forth between the two women's lives. One critic scolded the film for equating a young adult novice cook from Queens with the accomplished and infamous Julia Child, saying that the two were far from equals. In terms of accomplishment, I would say the critic has a point. But I don't think that's what he meant, and that's where I have a problem. The life story of Julia Child (played in the film wonderfully by Meryl Streep) reveals that she was not born a cook. In fact, she did not learn the art of French cooking until she was well into her 40s and began on television in her 50s. The film shows that she stumbled upon culinary interests when she was trying to figure out what to do with her time in Paris while her husband Paul (Stanley Tucci) worked as an officer for the U.S. Information Agency. She then struggled to get anyone to publish the 700+ page cookbook she and her French co-writers had developed. Julia's experiences reveal that she was very much human, just like anyone else... just like a young adult such as Julie Powell (Amy Adams) just trying to make her own way in the world in the early 2000s. Julia's story may give us an insight into a genius cook, but Julie's story gives us hope. For average, everyday people, Julie's story is all-too-familiar. Like so many others, Julie feels lost in her bureaucratic cubicle job. Like so many others, Julie is trying to figure out what she's really passionate about. Like so many others, Julie feels just a little bit cramped in her home, with never enough room to move around. And like so many others, Julie just wants her voice to matter in the world. Julie's story is one that I can identify with. She's a fellow blogger, only her love is Julia Child's cooking whereas mine is popular movies. The blog was Julie's way of sharing her insights with others, hoping it might make a difference for someone - just as this blog is my way of sharing my insights with you, hoping that it might make some difference in your life. So in this film about two women's adventures into cooking, one story is not better than another. Julia Child might be more famous, but Julie Powell proves that God mades us all worthy of our story being put to celluloid. To God, all our stories are special and worthy of a Friday night at the movies. To God, each of us has a unique journey to take - and watches with great anticipation what our next move might be. Society today has a way of extolling the rich, famous, and powerful, as if their stories are better than ours - even when your story and my story might be more interesting than those of the celebraties on TMZ.com or the world leaders at a G-8 Summit. That movie reviewer who critized the film for making Julie and Julia equals doesn't see people as God sees people - as all incredibly special in their own right. But what about you? Do you think that your story - and the stories of those average everyday people around you today - are just as great as your role models', heroes', and favorite movie stars' stories? God does. It is God that says to us: "I have called you by name. You are mine... You are precious in my eyes" (Isaiah 43:1,4) God has called Julia Child by name and Julie Powell by name, and they are both precious in God's eyes, each unique and wonderful in their own way. God has called you by name. God knows you and you are His. You, just like Julia & Julie, the President and the Pope, Meryl Streep and Amy Adams and any famous actor, the saints, the prophets, and all the great people of history, are precious in God's eyes. He is waiting to see what you'll do next in the great movie of your life... and so am I and all those around you. So go ahead, and make your next move. Make your life as extraordinary as God knows it is. Well done. I appreciate the reminder that "I am Gods" and that he is calling me to be great. I watched this film after a light meal and was so hungry while watching Julia cook that almost ate my neighbor's popcorn. Your insights in relating this to knowing who we are and that we are special in God's eyes really hit home with me. The hunger we all have for love, being accepted, finding our niche, wanting to DO something big...so much of this underlying the film now that you've got me thinking about it.